Sister Mary MacKillop of the Cross was born in Melbourne on January 15th 1842. A possible time of birth is 2.00.pm. This would give an overloaded 9th house, the Moon in Pisces and the practical sign of Taurus rising. The Taurean Ascendant is well supported by family circumstances as the MacKillop family were farmers near the city of Melbourne. Mary’s father studied for the priesthood in Rome for 8 years, returned to Scotland for further religious studies, then migrated to Australia in January 1838. There he married Flora MacDonald in 1884 and they had eight children, the eldest of whom was Mary. Due to unwise investment, the family experienced periods of poverty and Mary was forced to work at 15 to help support the growing family. At the age of 25, Mary arrived in Adelaide on Sunday June 23, 1867 and was given a black habit to wear by Rev. Woods and on August 15, 1867, Mary took her first religious vows. 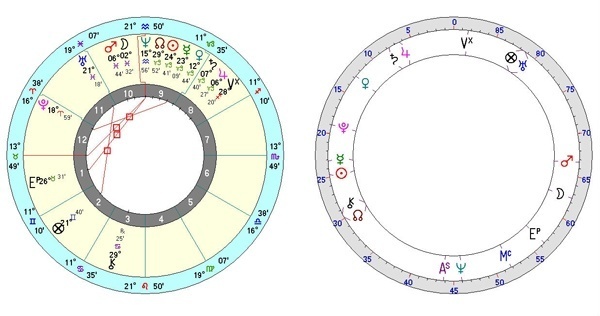 (Moon square Saturn; square Pluto = natal Neptune. She made perpetual vows on December 8, 1869. (Mars = Pluto; Pluto square Neptune; Node Opposition natal Node, Saturn = Uranus.) The foundation of the Order of St. Joseph occurred on March 19, 1866. At the time of her ex-communication on September22, 1871 and her reinstatement the following year, Saturn was transiting her natal Jupiter/Saturn conjunction. Mary MacKillop died in Sydney at 9.30am on August 8, 1909. At the time, a priest in Adelaide had a vision of her standing at the alter, as he was preparing communion. He knew that she had died. We show the death chart as the time was documented. 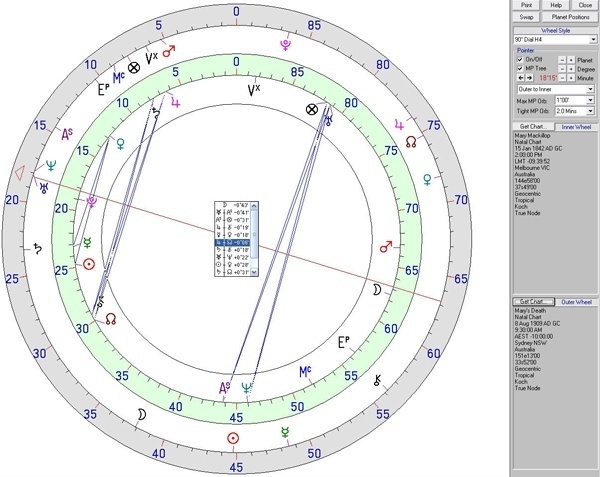 A separate natal chart is also shown. It is interesting to know that at the time of her death, Uranus and Neptune were in opposition. At the time of her beatification, 19th January, 1995, these planets were in wide conjunction with the Sun. Neptune has long been associated with religion, mysticism and spiritual fervour as well as fantasy, delusion, deception and disappointment, all of which she experienced in her lifetime. 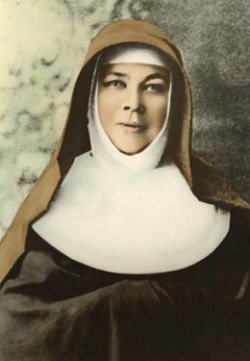 Mary Mackillop travelled extensively throughout Australia and New Zealand as well as making overseas journeys to England, Scotland and Rome. It was on one of these journeys to Rome that the constitution of the Sisters of St Joseph was ratified by Pope Pius IX. She was often at loggerheads with bishops and clergy alike, but overcame some of these difficulties as the St Joseph’s order continued to expand with new convents and schools catering for the poor and needy. Significant midpoints with interpretations from Ebertin’s Combination of Stellar Influences are as follows:- MO = JU/NO Attaching great importance to spiritual relationships, changing relationships. A happy union with women. SU = SA/ASC A keen awareness of the lack of freedom of movement, a strong desire to go one’s way in life. Difficult circumstances of living, suffering from conditions of the environment, the process of getting ill, the act of separation. SU = PL/NO The urge to impose one’s will upon others with ruthlessness and vice versa. ME = JU/ASC The inclination to cultivate an intense exchange of thoughts. ME=SA/ASC The influence of the environment upon one’s way of thinking, the misfortune to get into trouble through others, a change of environment, a trip. VE = JU/PL Creative power. A craving for indulgence. The giving of one’s love to many. Ve = SA/PL Self-discipline, a love of solitude and seclusion, asceticism. Estrangement and alienation, the desire to renounce love. MA = PL/SU The desire to perform record achievements, over-exertion or over-taxing one’s powers. The tendency to work to the point of a physical break down. JU = ME/UR Fortunate ideas, the gift of repartee, optimism and confidence. SA = SU/UR inhibitions and difficulties are overcome through extraordinary efforts. Sudden loss and separation. NE = MO/NO A show of sensitiveness in living together with other people. Disappointment through others. PL = UR/NE A person who is influenced or impressed very easily by others. PL = MO/MA One sided outlook, fanaticism, moodiness – a woman who stands alone in the world, periodic disturbances within the female organism. PL = SA/NO A tendency to sacrifice oneself for others, suffering shared together with others. (mourning and bereavement) Finally it should be pointed out that many people could be born with similar planetary configurations as Mary Mackillop, but they may not aspire to sainthood. To be proclaimed a saint it seems necessary to be born into a devout Catholic family and that the environment at the time is conducive to supporting religious conviction and vocation. Mary Mackillop satisfied all these requirements. However; to be made a saint, miracles will need to be performed in Mary Mackillop’s name. This may be the greatest stumbling-block she has yet to overcome. NB:- This article was written by Doris Greaves and published in the Regulus Ebertin Study Group Newsletter in March 1995 after Mary’s beatification on 19/1/1995, by Pope Paul 11. The article was also published in the New Zealand Journal of Astrology the same year. It took several years for a second miracle to be recognised but on 19th December 2009 the Congregation for the Causes of Saints issued a papal decree. Her canonisation was announced on 19th February 2010 and subsequently took place on 17 October 2010. As many as 8,000 Australians were present in Vatican city to witness the ceremony, thus making Mary Mackillop our first Australian saint. Bibliography: Paul Gardiner SJ, Mary Mackillop, the Authorised Biography, E J Dwyer/David Ell Press. Doris Greaves my mentor, was an Australian astrologer and Cosmobiologist. She founded the Australian Regulus-Ebertin Study Group in 1969 with the permission and encouragement of the late Reinhold Ebertin, and she founded the Federation of Australian Astrologers in 1970. I was drawn to Doris Greaves teachings as a very naïve person, not even knowing what a Sun sign was. I will be forever grateful for the many chapters in my life by joining her classes. Doris Greaves was an inspiration to me and so many others throughout the world. 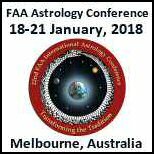 I am a board member of the Federation of Australian Astrologers and continue to keep her work in focus through my classes in Melbourne and through my writings here on this web site.